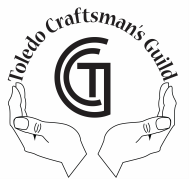 Once you are accepted for membership into The Toledo Craftsman's Guild, a $12 Initiation Fee and your annual Membership Dues are required before your membership becomes active. You must be an active Member of the Guild in order to apply to our shows. After your first year, membership dues must be paid by January 15. The annual dues may be paid by check or through the online store. The online store is open January 1 through February 15. Membership dues postmarked or paid online between January 16 and February 15 require an additional $12 late fee. Members who do not meet the February 15 late fee deadline will have to be re-juried for membership. Individual Memberships are $30 per year. Family Memberships are $35 per year. "Family" is defined as husband, wife, domestic partner and children under age 18 living under the same roof. Junior Memberships are $20. A Junior Member is defined as a child aged 12 through 17. Junior Members may participate in two (2) specific shows during their first year and additional shows after their first year. The initiation fee is waived. Additional information will be provided upon request. Team Memberships are $45. The purpose of a team membership is to allow a group of individuals (no more than 4) to display and sell their individual art/craft items under one membership and not to allow the use of employees to create these items. The awarding of such membership shall be at the sole discretion of The Toledo Craftsman's Guild Executive Board after a review of the membership application. Show fees range from $45-$60 (spring shows) to $70-$95 (fall shows). Spaces are generally 8 feet wide by 6 feet deep with the exception of 10 feet by 10 feet spaces at our spring Tam-O-Shanter show and our fall show at LineDrive Sportz (Lucas County Recreation Center). Table rental is an additional charge. Electricity is available at all shows, but there may be a small fee to use it. Members must supply their own floor length table covers (100% polyester and flame-retardant). (All prices are subject to change.) All Guild show applications are accepted on a "first come, first served" basis.